If God says He loves you, check it out. With the training of a newspaper legal-affairs reporter, Lee Strobel spent two years investigating that very claim, concluding that it boiled down to one central question: Did Jesus, or did He not, return from the dead? Strobel’s pursuit of a satisfactory answer led him to a number of scholars, both believers and nonbelievers, and eventually to a career as a Christian author and teacher. So you know what he came up with. But what you may not know is that he was one hard case. Strobel was an avowed atheist, convinced that “people created God because they were afraid of death,” and his hedonistic lifestyle revealed no spiritual inclinations whatsoever. “I lived an immoral, drunken, profane, narcissistic, self-destructive kind of life,” Strobel said Monday night, addressing a crowd of about 2,500 at GCU Arena that had come to hear his testimony for free. Although he was an award-winning journalist for the Chicago Tribune, he had a mess of a life, saying that his young daughter feared his arrival home from work. When his wife, Leslie, was befriended by a Christian woman in their condo building and made a decision to accept Christ, Strobel wasn’t impressed but figured he had nothing to lose in accompanying Leslie to church one Sunday. The service was in a movie theatre, the preacher was Bill Hybels, the topic was “Basic Christianity” — and Strobel left with a lot on his mind. The ground had been laid for his fact-finding project — and ultimately for a life of proclaiming the Gospel and defending the faith. 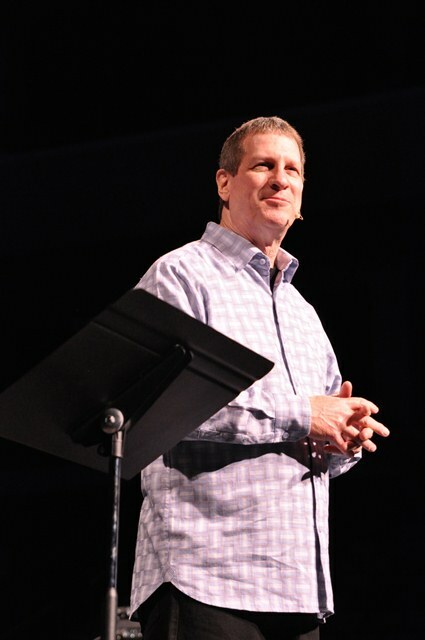 Strobel, now 61, went on to become a teaching pastor for 13 years at Hybels’ church, Willow Creek Community Church, in suburban Chicago and has written a number of best-selling books, most notably “The Case for Christ” and “The Case for Faith.” His son, Kyle, is an assistant professor in GCU’s College of Theology. Strobel hasn’t lost the everyman sensibility of a reporter, as he demonstrated in an hourlong talk that was entertaining, engaging and challenging. He carefully took the audience through what he called the “four E’s” that provide such evidence of Jesus’ resurrection: execution (“You need to have a body”), early accounts (including a first-century creed found in 1 Corinthians 15), the empty tomb and eyewitnesses.